Fueled by diamonds and black gold, Angola is taking its rightful place on-the-rise as one of Africa’s hottest new gaming destinations for both Angolan and international casino gamers alike. There are now over 10 land-based casinos in Luana with hot gaming spots in Bunguela, Lubango and Cabinda as well. Hip, trend-setting Angolans are not only enjoying the lifestyle of brick-and-mortar casinos but the anytime, anyplace fun and excitement of online casino gaming as well. While traditionally, Angolans have been focussed on sports betting, the new generation of Angolan casino gamers are onto the bangest online casino games around. You don’t need to leave your cubata to have a bom fim de semana! If you are like 13 million of your fellow Angolans enjoying the online lifestyle, you can bumbar all week and then relax all weekend long while playing the funnest, sexiest and newest online casino games for real money in Angola. Play from your bed, your brother-in-law’s, or from your favourite quintais. 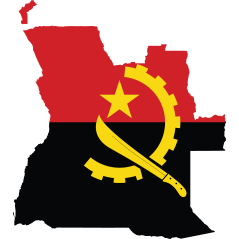 As Angola has grown into an internationally known name in online and land-based casino gaming, the Angolan government, led by visionaries such as VP Bornito de Sousa, has created a set of protective laws for gamers in the lottery, land-based, and online casino environments. Now gamers in Angola can relax and enjoy their favourite blackjack, table games, roulette, video poker, baccarat, and slots games knowing that the odds are fair, numbers and cards are random, and that all payouts happen on time, every time. When it comes to online casino games for real money in Angola, Springbok Casino is truly fixe. You get the top-shelf international online casino experience with all the benefits of local Angola-focussed banking and 24-7 toll-free Angolan customer service. Springbok Casino, which was established in South Africa by Africans for Africans, also provides you with the international benefits of Real-Time Gaming. RTG for short, guarantees you’ll get all the international casino table games like online blackjack, online roulette, online craps, and online poker as well as hundreds of the hottest new slots arrivals featuring themes from current movies, music, and world events. Springbok also gives Angolan gamers an exclusive offer to play for free for as long as you like in practice mode before trying your hand as a real-money online casino games player. And even once you join the fray and start winning real jackpots and payouts, you can still switch back to practice mode anytime you want to work on your strategy. Come enjoy and play your way any day at Springbok Online Casino. Angolan players also have three great ways to enjoy Springbok Online Casino’s hundreds of online games. First, you can access the casino from either your computer or your mobile phone. To play from your mobile, download the exclusive Springbok Casino app, and follow the onscreen instructions to create a free username and password. Now you’re ready to play both in practice and real-money mode! On your personal computer or laptop, you can also download a full free version of Springbok Online Casino for the ultimate in playing pleasure at home. Or if you prefer, choose “Instant Play” mode and get all the Springbok fun right from your favourite web browser. Não bazar without Your Free Cash Bonus! Start your real money casino adventure with a huge welcome bonus just for Angolan players when you sign up for your free, new player account. Springbok Casino was founded in South Africa, so all your AKZ cash deposits will be converted to Rand, and then converted back to Kwanza when you withdraw your winnings. And está anduta! Here’s how it works. When you make your first deposit - up to 1500 ZAR - you get an amazing FULL 100% CASH MATCH on your deposit Rand-for-Rand so your account will actually be credited with 3000 ZAR for gameplay. Remember to use your activation code: SPRINGBOK100. For your second deposit, use SPRINGBOK50 to get another amazing free welcome gift from Springbok Casino. This time, it’s an additional 50% FREE CASH to be added to the amount of your second deposit. This means when you put 10,000 Rand, you’ll receive another 5,000 Rand from Springbok absolutely free - bringing your total deposit amount this time to 15,000 Rand. Your third deposit works exactly like the second. Put in another 10,000 ZAR to your player’s account and get an additional FREE 5000 ZAR from Springbok Casino. Again, be sure to use the SPRINGBOK50 code at this third stage of the welcome bonus. Springbok Casino wants you to truly have a chance to explore all the fun and excitement of real money games. And to prove it, after your first three deposits we give you another FREE CASH bonus of 250 ZAR - this time with NO deposit required. Save your activation code: TEST-SPRINGBOK to be sure you cash in on this guaranteed jackpot. And the daily, weekly, monthly, special promotions just keep on coming. The Springbok team keeps the excitement levels high crediting your account with Free Spins, exciting contests, cash bonuses and more. Start today! Get an amazing free 11,500 ZAR in free bonuses when you Sign-Up with Springbok. Meus amigos, bazar sem todo esse dinheiro livre seria uma grande pena! Once you’re signed up, be sure to check out the Springbok Casino’s large selection of slots and poker progressive jackpot games. These games have life-changing jackpots tipping well over 1 million Rand just waiting to be collected by a lucky winner, so act fast because it could go at any moment! Check it out! Springbok online casino has got every kind of chance, skill, and table game you can think of from bingo to video poker, baccarat, blackjack and table games such as poker, roulette, and craps. And Springbok’s got bué bué slots, so many slots you never imagined - but I promise you, once you start, você não vai parar! For you super-savvy Angolans who want to go deep, you can become international tournament-level masters in Poker, Blackjack and more! Springbok has a great Tips and Strategy section to support you in your pursuit, and we encourage you to really understand how game odds work, and to learn the strategies and skills necessary to be a true casino champion! Springbok Casinos have partnered with tens of trusted local Angolan banks, financial establishments, cash merchants and payments providers to give you deposit and withdrawal options that are smooth and sophisticated. Springbok uses 128-bit SSL encryption (just like that used by international banks) so you know your casino banking is secure and safe. Deposit and withdraw using your Angolan Visa or Mastercard; EasyEFT - free, secure, electronic funds transfer from your Angola-based bank account; standard wire transfer; or Secure Instant Deposit. If you prefer a more discrete banking method, we recommend you try EcoPayz, NetTeller or Skill. Or use your cryptocurrency - Springbok accepts Bitcoin! Whichever you choose, you’ll experience hassle-free and secure depositing and withdrawing from your Springbok casino account. Boa sorte, bom divertiento, and até logo! At Springbok, you’ll always game with gusto! Just look for the glittering green and gold Sign-Up button, get your free welcome bonus cash and you’re good to go!